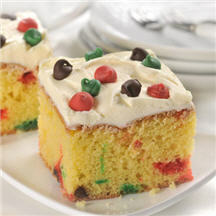 Fond memories will be made during holiday get-togethers when your family and friends taste this delicious cake. For cake: Preheat oven to 350°F (175°C). Grease and flour 13x9x2-inch baking pan. Beat eggs in large mixer bowl for 1 minute or until frothy. Add cake mix, pudding mix, water, oil, rum extract and nutmeg. Beat on high speed for 2 minutes. Stir in 1/2 cup of morsels. Spread in prepared pan. Sprinkle 1/2 cup morsels over batter. Bake for 35 to 40 minutes or until wooden pick inserted in center comes out clean. Cool completely in pan on wire rack. Spread frosting over cake. Sprinkle with remaining morsels. For Frosting: Beat cream cheese and butter in small mixer bowl until smooth. Gradually beat in powdered sugar and nutmeg until smooth.